Overseer Network Monitor is aware of many protocols, such as HTTP, FTP, ping, etc. Overseer does not natively support all application protocols, however. The TCP Socket monitoring resource type is the answer to this. 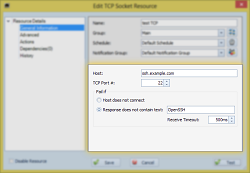 Overseer's TCP Socket resource type will connect to any port on any host using a base TCP socket. Overseer will then notify the administrator via Email or text message if the connection fails. Overseer can also check the response from that port against pre-defined text, to make sure it's responding with the correct response. For example, if you're monitoring SSH, you might make sure the text that the server responds with contains the text "ssh". Overseer will connect using a basic TCP Socket and notify if this connection fails. Overseer can evaluate the response text of the TCP connection to make sure the correct server is responding to the connection request. The time Overseer waits for the server to send the response text can be configured. This can be useful to detect when servers are responding slowly or not at all, once connected. Overseer is protocol-aware for many different resource types. See the full Overseer monitoring capabilities page for more.